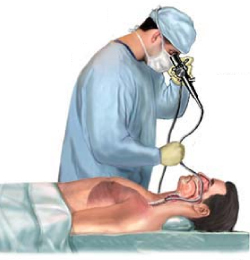 Bronchoscopy is a technique of visualizing the human airways using an endoscope called bronchoscope. It is a thin tubular instrument that can be flexible or rigid (metallic) fixed with a video camera at one end and viewer at the other. Flexible bronchoscope is more common than rigid type as there is no need to give anesthesia and can be performed easily as an outdoor or daycare procedure in the Bronchoscopy suite or even bedside of the patient. videobronchoscope is an advanced equipment which replaces the flexible bronchoscope. It has a charged couple device at its tip which captures images and relays to a video-processor unit which then displays the images on a monitor. The images, thus produced are magnified and much sharper. Multiple images can be examined together, video recordings performed and shared with the patients. 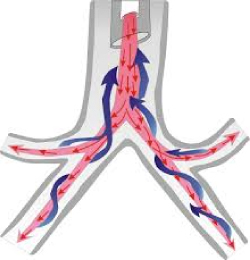 The airways are like hollow tubes starting with one large sized which then divides into multiple smaller ones. The windpipe (trachea) is the main and the largest. It divides into right and left bronchi, each of which then divides into lobar followed by segmental and sub-segmental bronchi. Bronchoscope is introduced through the nose or mouth, passed through the throat (pharynx), vocal cords (larynx) to enter the windpipe (trachea). It is then passed into the right or left bronchi, the lobar bronchi and then the segmental bronchi. Through the bronchoscope the physician is able to visualize the abnormality in the airways such as inflammation, tumors, bleeding and for taking tissue samples or mucus, if any, and perform various procedures which help in making the accurate diagnosis and guide appropriate treatment. The entire procedure usually takes no longer than 5-7 minutes however the various procedures, if carried, out may require additional time. It is one of the most effective ways of diagnosing lung diseases such as Pneumonia, Tuberculosis, Lung cancer Bronchitis, Sarcoidosis and a host of other diseases involving lungs, airways and lymph ods inside the chest (mediastinal glands). for temporary control of bleeding from the airways. Fever: A mild fever may occur but is rare. Over-the-counter fever medicine will help. Nosebleed: Since the lining the nose is very delicate, a nosebleed may occur. Typically, it will stop on its own. Stridor: If one has stridor, it may temporarily get worse due to the effect of the medicine used during the procedure. A change in voice or noisy breathing may occur, but is also usually temporary. Wheezing: patients with a history of lung disease, such as asthma, may need additional medication to treat signs of wheeze both prior to and after the procedure. Hemoptysis : some amount of blood may appear on coughing for a day or two in patients in whom TBNA or TBB have been performed but is usually self limiting. Pneumothorax : the chances of lung rupturing and air leaking out are there but very low. This occurs only if TBB has been performed. This is a life saving procedure performed during bronchoscopy to rapidly control the bleeding from the airways or lungs. It is a simple procedure but requires high end expertise. 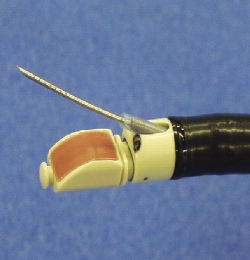 After identifying the site of bleeding, an endobronchial balloon is threaded over a guide wire and inflated at the opening of the bleeding segment to produce tamponade. Once bleeding comes under control the balloon can be easily pulled out. The procedure has >90% success rate. In patients with bronchogenic carcinoma, when the tumour is occupying and obstructing the passage of air resulting in breathlessness, after debulking the tumour with LASER a stent is placed to keep the passage patent. 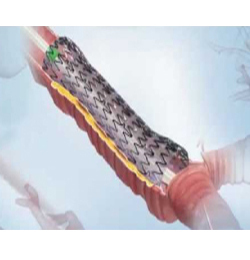 This is a self expandable metallic stent which is placed under local anaesthesia during flexible bronchoscopy and provides instant relief to the patient. Patients with tumours or cancers which are obstructing the air passage develop breathlessness which does not improve with any medication. Such patients receive instant benefits by debulking the tumour using LASER. 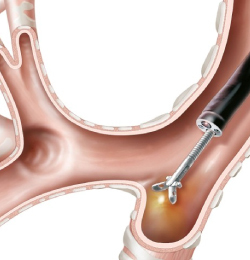 This procedure is done through the bronchoscope under local anesthesia. This a specialized diagnostic procedure carried out to access the lymph glands which are lying outside the airways but inside the chest (area is called mediastinum). It is usually done for diseases like Sarcoidosis, Tuberculosis, Lymphoma, Multiple myeloma etc. A very fine needle is used to go beyond the confines of the tracheobronchial tree during the bronchoscopy. It can also be used for the diagnosis of growths or tumours present within the airways but carrying a high risk of bleeding with biopsy. It carries a diagnostic accuracy of 65 to 75% approximately.